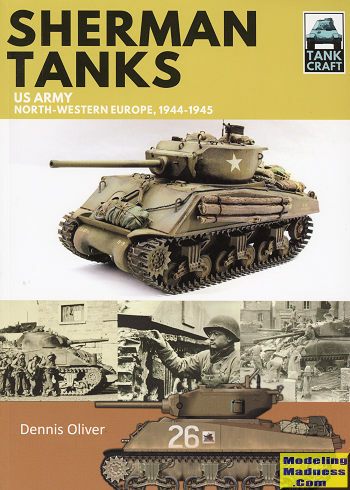 This book from Pen & Sword's series on military vehicles concentrates on the Sherman tank as used by the US Army in Northwest Europe during 1944-45. There are other volumes that will cover British use. While not the best medium tank, the Sherman was reliable, fairly well armed and had decent armor. It was not a direct match to German medium tanks, which often had greater firepower and armor, but the German tanks were not as dependable and were not available in the sheer numbers that the Sherman was. The only tank that was built in greater numbers than the Sherman was the Soviet T-34 series. Like the T-34, the Sherman lasted well into the 60s, though it was heavily upgraded by that time. This book concentrates on the US versions and like anything that has been in service for a while, experience in battle dictated several modifications. These were often made on the assembly like so one tank would have certain features and the next one in line would have the modifications. This book provides a bit of assistance in being able to identify these variants. As seems to be the case with some books in the series, we get a brief look at how each of the Army's armored divisions used the tank and their combat record. There is then a fairly large section of large profiles, often accompanied by a photo of the vehicle in question. Then we get to some feature model builds along with a rundown of kits and accessories that are available to the Sherman builder. This is followed by a brief section that helps one identify the major features of the different types. There sorts of books where you have a mixture of history, camouflage and models are becoming more and more the norm. This one is well done, though I found that plunking the color portions of the book in the middle breaks the flow of reading. I am sure that was done to cut down on production costs and once you get used to it, it works out well. Review book courtesy of Casemate Publishing, where you can order your copy of this and many other superb books. You can get this book at this link.